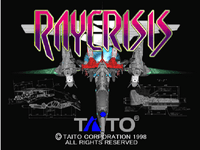 RayCrisis, known as RayCrisis: Series Termination in North America, is the third game released in the "Ray" series of Taito shooting games. Chronologically, it is considered a prequel to the first game, RayForce. First released for arcades in 1998, it supported co-op mode for two players, which the PlayStation ports released in 2000 lack; these ports are the only games in the "Ray" series to lack co-op. RayCrisis, being a prequel to RayForce, details the events during the timeframe of the supercomputer called the Neuro-Computer Con-Human gaining sentience and rebelling against its human creators, a direct result of a misguided scientist trying to bond a human clone to Con-Human mentally. Now, against Con-Human's massive attack forces laying siege to the Earth, exterminating and cloning humans, a mecha-neurologist jacks in to the Con-Human system in an attempt to regain control of the rogue machine by means of the computer viruses, known as the Waveriders, into the Cybernetics Link, engaging Operation Raycrisis to cease the supercomputer's destructive actions permanently and prevent it from causing more havoc in the future. The gameplay of RayCrisis is based on RayForce, which features a viewpoint given to the player with an overhead perspective. The game is a vertically-scrolling shooter with a "virus infiltration" theme: the player plays the role of the Waverider computer virus, and the enemies he or she encounters are Con-Human's antibodies, programmed to terminate any virus—including the player—getting inside the supercomputer's system. Source: Wikipedia, RayCrisis , available under the CC-BY-SA License.